Please Note:• Pearls for cup and peg settings should generally be at least 2mm larger than the cup. 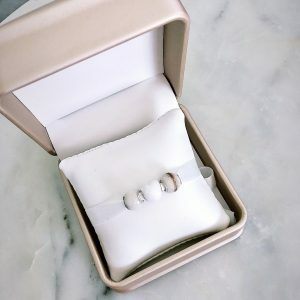 • IMPORTANT: Sterling silver is an alloy containing metals that react with chemicals found in air and produce tarnish; high moisture levels, exposure to sunlight and contaminants such as salt water increase this reaction. Most tarnish is easily removed by polishing with a mild abrasive or soaking in an anti-tarnish solution.